Date Night ends a California travel hiatus with another hot date. We have been in Orange County, sampling the restaurants there. It’s tough to find a bad meal in California! Staying with the California theme, we head west, to the “West Midtown” area, where places keep popping up that we have not tried. The name says it all about West & Mill. It’s on the westside and it’s in an old mill. Or is it because it’s at the intersection of Marietta and Howell Mill. Right next to Five Seasons. 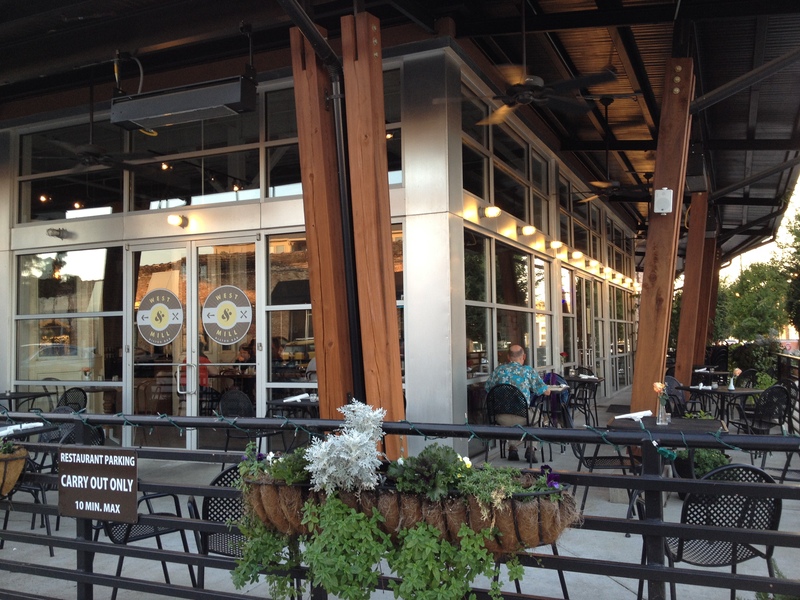 West & Mill is overshadowed by Five Seasons, which shares the patio from which we dine tonight. It’s a beautiful evening in the ATL and we can see Bocado from our seats as we can feel the aura from The Optimist, which is also nearby. Have we found a hidden wonder on the Westside? Let’s crack open the menu to find out. Fall weather means darker beers. As always, we start on the beer menu, which should be good because you can also see our favorite beer store, Hop City, from where we are. The beer list does not disappoint. There is nothing on tap, but the 20 beers available are not advertised on TV, which means they are craft beers. Tonight’s selections are Monday Night Drafty Kilt, a fine Scotch brown ale that is brewed right down the street, and a Leffe Brune from Belgium. 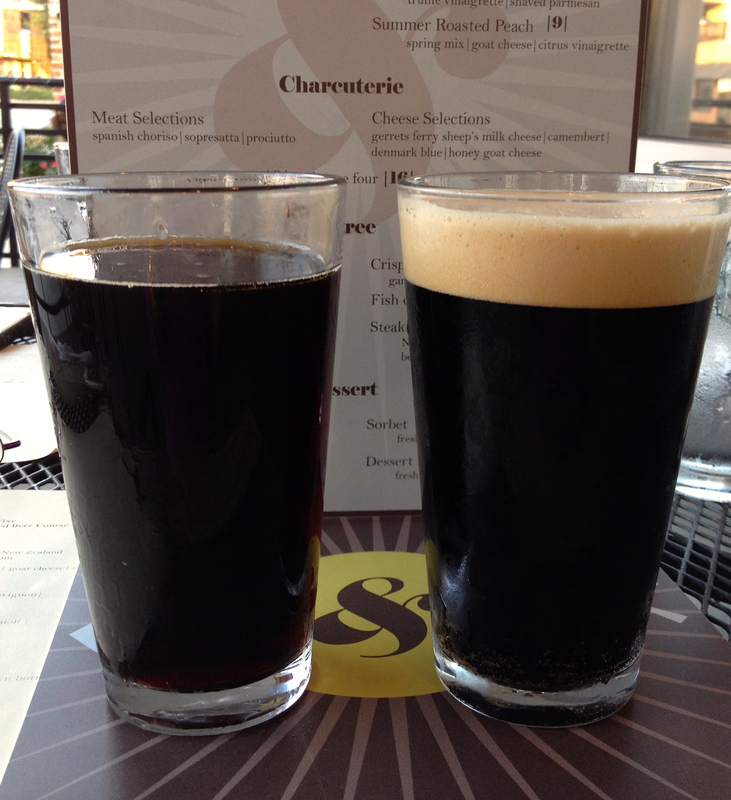 Both are nice and malty, and get the night headed in the right direction. We should mention that the beer prices here are about $1-$2 less than the surrounding places, so stop in for a drink if you want. The menu is pretty limited, but what they do here, they do well. 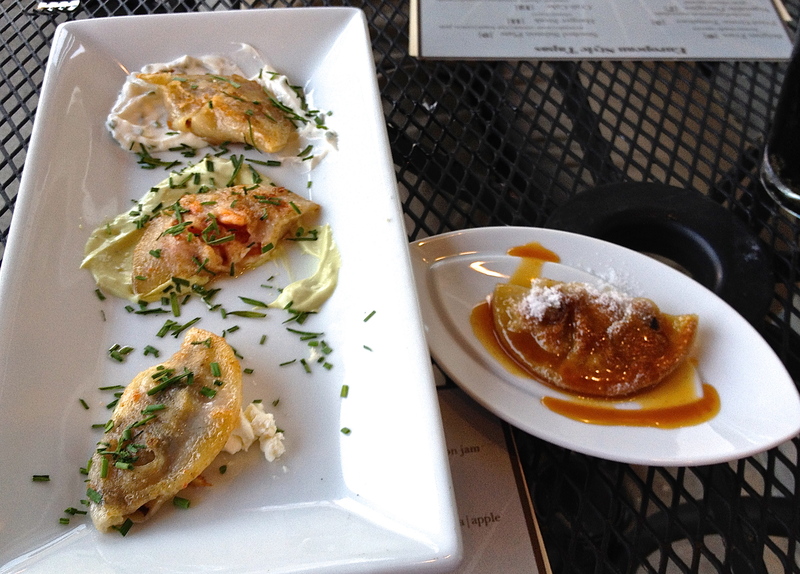 West & Mill has around 10 tapas selections for appetizers. There are four types of pirogies, which you can order separately, or in a combo. In the interest of sampling all four, we get the combo, which gets us one of each. They are tiny, but we cut them in half and each of us gets a nice taste. On the top is the bacon and cheese pierogie, which tastes a lot like a potato skin. It’s served on sour cream. The middle one is the seafood, which changes daily. Today’s features shrimp on an avocado sauce. On the bottom is the vegetable, which tonight is crimini mushroom. It’s served with goat cheese. On the plate by itself is a dessert pierogie. 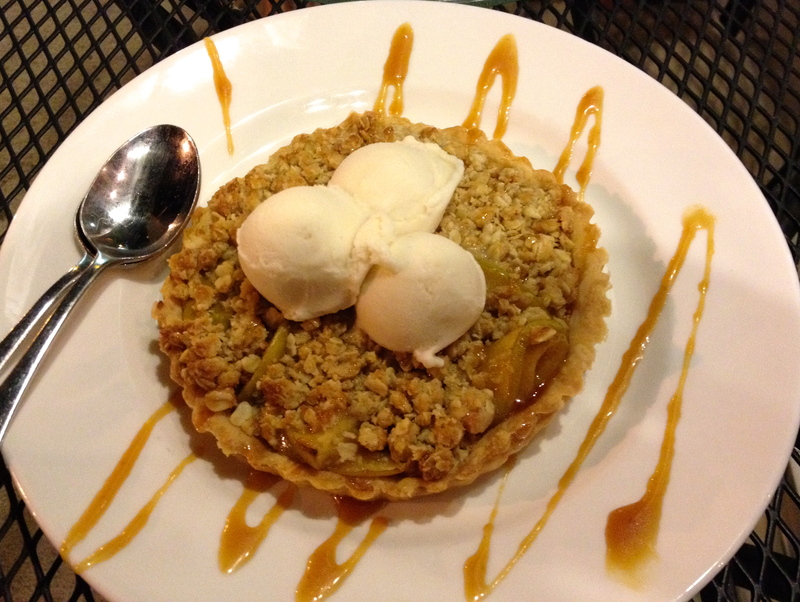 Life is short, so eat the fresh apple with caramel pastry before your entree. Since nobody was looking, I did lick this plate. Please don’t tell! There are only five entrees on the menu. 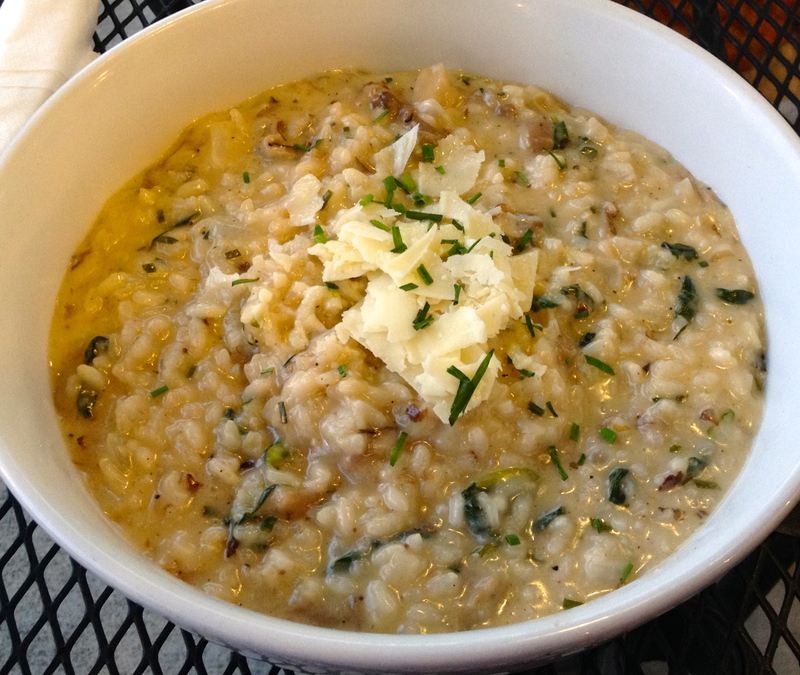 We go with the vegetable risotto, which is full of three kinds of mushrooms and creamy parmesan cheese. This is a very large bowl of food, which you should share with your date because you can’t eat it all yourself. Johnny Appleseed would be proud of this large apple tart. And speaking of large, we get the apple tart for dessert, which could feed four people. That’s vanilla ice cream on top of the warm apple filling and caramel sauce to boot. It’s a sweet way to end what has turned out to be a really good meal. 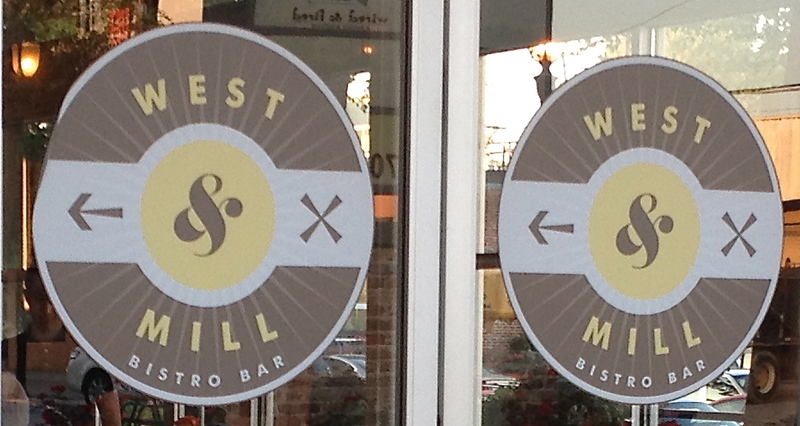 The bottom line on West & Mill: A fun place to go for a date! Sit outside if you can because there’s always something going on in this area, although it can get noisy on Marietta Street. The food is good and so is the service. In fact, the manager came by at least twice to make sure we were having a good time, and we were. Check it out if you are in the mood for some small plates and shareable entrees.